Bullying is one of the biggest issues schools may face, and it’s made worse when students don’t feel empowered to prevent or stop it. 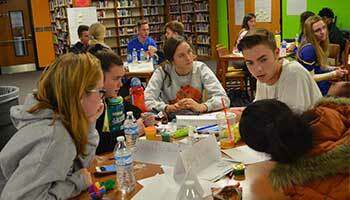 To change that, Gahanna Lincoln High School has implemented Green Dot, a bystander intervention training program for students created to prevent power-based violence. Power-based violence is any act of violence that is motivated by power or control, such as dating violence or bullying. When Cheryl Lowery, a health teacher, heard about Green Dot, she brought it to the school’s attention and Gahanna Lincoln became the first school in Ohio to implement the program. “Everyone should come to school feeling welcomed, wanted and loved,” said Assistant Principal Tim Gagliardo. Green Dot provides student-trainees with two ways to end power-based violence: proactive and reactive methods. Proactive efforts include promoting awareness that violence will not be tolerated, and everyone is expected to do their part to foster a safe school community. Reactive efforts include directly interacting with the potential perpetrator or victim, distracting the perpetrator to diffuse the situation or delegating the task of intervening to someone else, such as an administrator. These efforts are used to stop potential dangers from happening or to decrease the likelihood the situation will get worse. 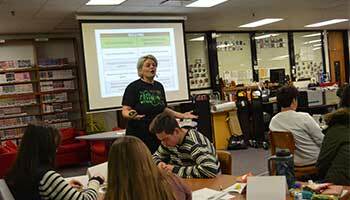 All of Gahanna Lincoln’s staff, from guidance counselors to teachers, have or will soon receive Green Dot training. However, the current focus is on students. 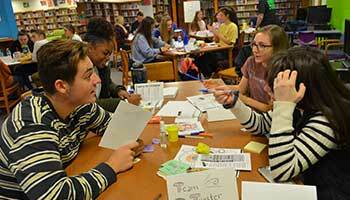 “They hold the power to create the culture change the school hopes to see,” said Gagliardo. Students are selected for the program through a survey sent to all juniors and seniors asking them to list their most influential friends. Those peers are then asked to participate in the training. So far, 150 students have been trained and 90 more will receive training in the next several months. Why does Gahanna need Green Dot? The advancement of technology and social media has resulted in cyberbullying and other unwanted behaviors. Social media provides bullies with a large platform and it doesn’t go away when the school day ends. Along the same vein, students today may feel inclined to record a fight on their phone than to step in and stop it. This is the type of reaction the school hopes to end with Green Dot. The program also focuses on dating violence as many high school students are experiencing their first relationships and may not know how to recognize abusive behavior. Greed Dot students are trained to help spot the signs of abuse. Schools in Kentucky that have implemented Green Dot have seen acts of personal violence reduced by more than 50 percent. Gahanna Lincoln hopes to see the same great results. In fact, Gagliardo already is seeing signs of a culture shift. While it’s still a work in progress, the students of Green Dot are making a difference school-wide.